April 07, 2014, 3:08 p.m.
Last Wednesday the Supreme Court ruled that a cap on the total amount of money any individual can donate to all campaigns and parties each election cycle was unconstitutional. In a 5-4 judgement, passed with the support of the court&apos;s conservative members, the total cap was held to violate the free speech protections afforded to individuals by the First Amendment. Justice Breyer, writing a dissent from the majority opinion, said that the decision risked "opening the floodgates" to money in politics. 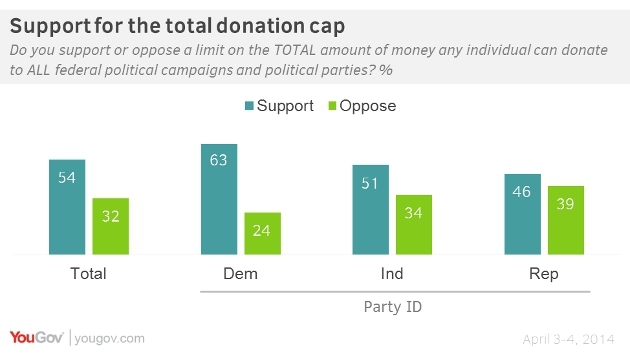 The latest research from YouGov shows that most Americans (54%) support the cap on total donations. Democrats (63%) tend to be most supportive, but even Republicans tend to support (46%) rather than oppose (39%) the federal campaign limits. Asked whether the cap on total donations is a violation of the constitutional right to free speech, Americans were even more definite. 58% of the public say that the caps do not infringe on free speech, while only 23% say that they do. The decision by the Supreme Court only struck down total caps on political donations, leaving intact the cap on how much money can be given to each particular candidate. Chief Justice Roberts made a point of stating that this cap was not being overturned, but many political analysts believe that this change may occur in the near future. 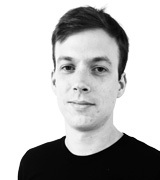 Support for caps on donations to individual candidates is higher than support for the total cap, with 60% supporting individual limits and 28% opposing them.